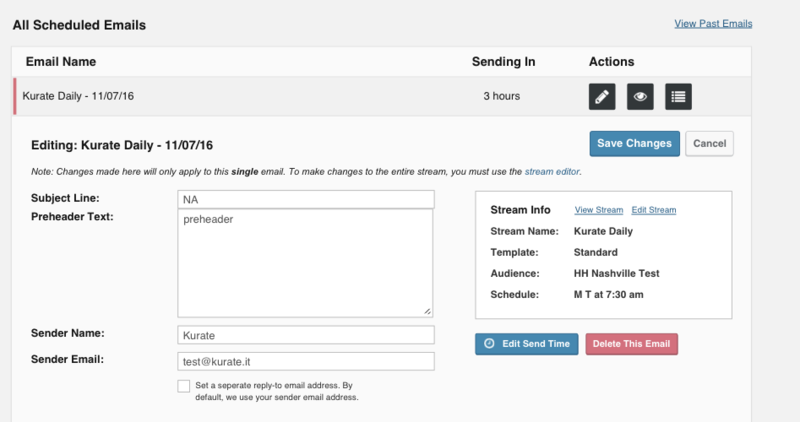 After you've set up your first stream, kurate.it automatically schedules the next two weeks of emails. You can then edit the basic settings for each email in order to customize the content you deliver to your subscribers. 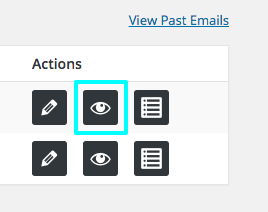 Eye: This allows you to preview what the email will look like when sent. List: This shows all the emails in the stream. With the email editor, you can overwrite all of the stream defaults that you setup when you created the stream. After customizing your email, click the preview icon to see your changes in action. Congratulations! Your emails are ready for sending. We recommend that you create a test group in Emma and send a test email to ensure that everything is setup correctly before you go live.